The Fujifilm X-M1 is a lightweight compact system camera featuring a retro design that bears more than a passing resemblance to its bigger brothers, the X-E1 and the X-Pro1. At the heart of the X-M1 is the same 16.3 megapixel APS-C sized “X-Trans” CMOS sensor, which has a colour filter array that mimics film grain and no optical low-pass filter for higher resolution images. The X-M1 has a 920K dot tiltable 3-inch LCD screen, 5.6fps burst shooting, built-in wi-fi, new EXR Processor II, a pop-up flash and external hotshoe, a range of film simulation modes and creative effects, and Full HD video recording capabilities at 30 frames per second. A new standard XC 16-50mm F3.5-5.6 OIS zoom is available as a kit lens which is more compact and lighter than the existing 18-55mm zoom. The Fujifilm X-M1 is available in three colours - Black, Silver and Brown - priced at £599.99 / $699.99 body only or £679.99 / $799.99 with the XC 16-50mm lens. 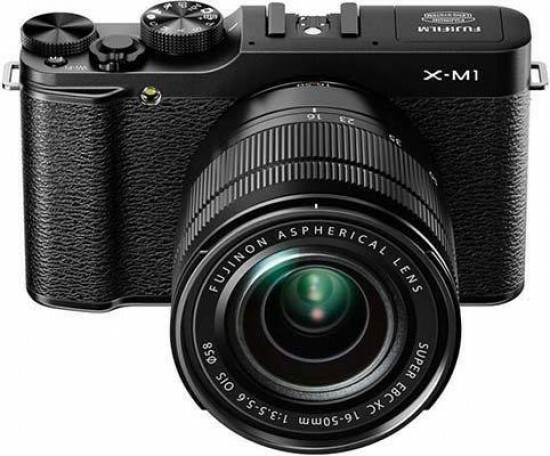 The new X-M1 further expands Fujifilm's X-series of premium digital cameras, which includes the range-topping X-Pro1, X-E1 and the popular X100/S, amongst others. The X-M1 is a more mass-market camera, smaller and lighter than the other models and for-going a viewfinder, but adding a tilting LCD screen and wi-fi connectivity. As with the X-Pro1 and X-E1, the Fujifilm X-M1 is a classically styled interchangeable lens camera that recalls film rangefinders from the past, with a lovely retro design that draws admiring glances from everyone that sees it. At the same time Fujifilm have once again incorporated modern technologies that help ensure that the X-M1 isn't simply a blast from the past. Smaller, lighter and less expensive than the X-E1, the X-M1 dispenses with any kind of viewfinder, either optical or electronic, and it doesn't accept a hotshoe mounted viewfinder either, making image composition a hold-at-arms length affair. While this is perhaps inevitable given the significant decrease in size and weight, and is in-line with the X-M1's main competitors, it does feel rather strange using a Fujifilm X camera that you can't hold up to your eye, especially when Fujifilm have made such a big play of their innovative viewfinder technologies. The X-M1's rear LCD screen attempts to redress the balance by offering the ability to tilt it up or down from a high 85° angle to a low 90° angle, perfect for both overhead and low-down shooting. With a resolution of 920K dots, it's twice as detailed as the screen on the X-E1, but sometimes proved to be a little hard to see in the unusually bright British sunlight that we predominantly tested the camera in. The X-M1 is the first X-series camera to feature built-in wi-fi connectivity, although it's rather restricted in use as it has to be paired with a smartphone. Install the FUJIFILM Camera App and you can transfer your pictures immediately to a smartphone or tablet PC and then edit and share them as you wish, transfer stills and video onto the camera, and embed GPS information in your shots from your smartphone. Note that you can't control the camera remotely, only transfer images. The FUJIFILM PC AutoSave software provides a simple means to back up your photos to your home PC. Despite its significantly lower price on launch, the Fujifilm X-M1 is another well-built X-series camera, with very little no flex or movement in its chassis, despite having more plastic in its construction. Iit's actually much lighter than a first glance might suggest, weighing in at 330g body only with the battery and memory card fitted, although that's only 20g lighter than the X-E1. Measuring 116.9mm (W) x 66.5mm (H) x 39.0mm (D), it is quite a lot smaller though. There are quite a few plastic buttons and controls on the X-M1, most notably the memory card / battery compartment door and the flap for the HDMI port, both of which wouldn't look or feel out of place on a cheap compact, and the rear controls, especially the second thumb-operated control dial. 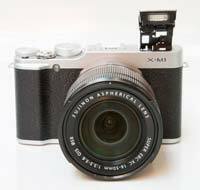 Otherwise the X-M1 is very well constructed. The X-M1 has a subtle but fairly effective hand-grip at the front and a dotted space at the rear for your thumb, with your grip helped in no small part by the textured faux-leather surface that runs around the full width of the camera. Two small metal eyelets on either side of the body are used for connecting the supplied shoulder strap, which isn't quite as luxurious as the rest of the package. A metal tripod mount is positioned slightly off-centre from the lens and next to the memory card / battery compartment, so you'll have to remove the camera from the tripod to change either of them. At the heart of the X-M1 is the same 16.3 megapixel APS-C sized “X-Trans” CMOS sensor found in the X-Pro1 and X-E1, with APS-C being a size that's more commonly used by the majority of DSLR cameras than by compact system cameras - Sony's NEX range and Samsung's NX series are the others. Fujifilm actually claim that the X-M1's sensor will deliver image quality that surpasses most APS-C DSLRs and even some full-frame ones, and as our test photos and sample images on the next two pages show , the X-M1 actually does live up to those claims. We won't say any more at this point other than to recommend that you take a look at our Sample Images for yourself. Helping to keep the image quality high is the new 16-50mm zoom lens. With a plastic mount, slower apertures and no aperture ring, at first glance it seems to be a poor alternative to the 18-55mm f/2.8-4 OIS optic, but its low weight and compact size are better suited to the smaller X-M1. It still offers the added benefit of built-in optical image stabilisation to help keep your images sharp, and most importantly doesn't skimp on image quality, making it a cut above the kit lenses that ship with most interchangeable lens cameras. The 18-55mm lens' fairly fast maximum apertures in conjunction with the large APS-C sensor make it easy to throw the background out of focus and achieve some really nice bokeh effects. The combination of the fast apertures and the extensive ISO range of 100-25600 makes the X-M1 very well suited to low-light shooting, allowing you to hand-hold the camera in places where you'd usually be reaching for a tripod (if allowed) or other support. The clever ISO Auto Control setting allows you to set a maximum sensitivity (up to 3200) and a minimum shutter speed (1/30th is a good starting point), with the camera over-riding your ISO choice if it thinks you're being too ambitious whilst maintaining a shutter speed that won't introduce camera shake. With its focal-plane shutter, the X-M1 has a very adaptable top shutter-speed limit of 1/4000th second in all shooting modes. Consequently there's no built-in ND filter as on the X100/S, so if you want to use, say, the excellent 35mm lens at F/1.4 in very bright sunlight, then it's a good idea to buy an actual glass ND filter (52mm), otherwise you'll have to stop down to achieve a correct exposure. The Fujifilm X-M1's auto-focusing speed is quick, with a quoted fastest auto-focus time of 0.1 seconds, although it was slightly slower when using the 16-50mm kit zoom. DSLR owners accustomed to the quick reactions of their phase-detection cameras will likely find the still slightly perceptible delay of the X-M1 as it locks onto the subject mildly annoying, but it simply won't be an issue for the majority of owners. The X-M1 has 49 individual AF points laid out in a 7 x 7 grid, with the ability to change the size of the focus point via the rear command dial to achieve more precise focusing. Manual focusing is activated via the Focus Mode main menu setting and then using the ring that encircles the lens to focus. The X-series lenses have an electronically coupled focus-by-wire manual focusing ring, rather than a physical one, which in practice is less responsive both in terms of feel and speed. 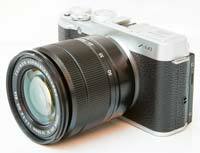 We criticised the X-E1 for taking a lot of turns to change the focus from 0.1m to infinity. Fujifilm have cleverly made the focusing ring more sensitive to how you use it - turn it slowly and the focusing distance changes slowly, but turn it more quickly and the camera quickly moves through the distance scale. It now takes less than 2 full turns and a couple of seconds to jump from the closest focus distance to infinity, a big improvement on the X-E1. 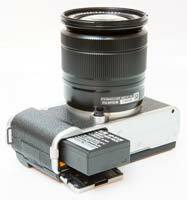 The X-M1 offers two ways of manually focusing. Firstly, there's a handy blue distance scale along the bottom of the LCD screen, with a red bar indicating the the focusing distance and a white bar showing the depth of field, which actually changes in line with the current aperture - very clever. The X-M1 has another trick up its manual focusing sleeve in the shape of the rear command control (the dial which sits under your right thumb). You can press this in to magnify the view, making it much easier to judge precise focusing. The second method is the Focus Peak Highlight function, which displays a white line around the subject when it's in focus, something that Sony NEX users in particular have been enjoying for a while. Both of these make manual focusing on the X-M1 more of a pleasure than a chore, although the revised fly-by-wire manual focusing ring operation is arguably more important. To make the camera less obtrusive there's a clever Silent menu option which turns off the speaker, flash, AF-assist lamp and most importantly the artificially-created shutter-release sound, instantly making the X-M1 perfectly suited to more candid photography. In terms of operational speed, the Fujifilm X-M1 is actually quicker in some ways than the more expensive X-E1 and X-Pro1 models, thanks to the new EXR Processor II. AT 0.05 secs shutter lag is virtually non-existent on this camera, so once you have set the focus, you'll never miss the moment because the camera can't fire the shutter quickly enough, and the start-up time is only 0.5 secs. The write speeds from pressing the shutter button to recording to the SD / SDHC / SDXC memory card are perfectly acceptable. Shooting a single RAW + Fine JPEG takes about 5 seconds to record to the card, but you can take another shot almost straight away. Continuous shooting speeds are also good, with a top rate of 5.6fps for around 30 JPEGs or 10 RAW files, depending on the speed of your memory card, with a slower 3fps speed also available for around 50 JPEGs or 10 RAW files. Note that both the focus and the exposure are set according to the first frame in each series, so it's not a particularly good system for tracking fast-moving subjects in varied lighting conditions, Thankfully the camera no doesn't lock up completely for a long time if you shoot the maximum number of images in a burst, allowing you to continue shooting after just a few seconds. Located on top of the X-M1 are a small but responsive shutter release button, encircled by the On/Off switch. Alongside is the Wi-Fi / Fn button, which by default during shooting provides quick access to the ISO speeds, but can be customised to suit your own needs from 12 different settings. Further customisation is available via the Custom Menu option, which lets you create, save and recall a set of user-defined settings. There's an external flash hotshoe for suitable dedicated external units, and the handy built-in pop-up flash which has a guide number of 7 at ISO 200. This is released via the Flash button on the rear of the camera, and its clever hinged design positions it above the lens and helps to reduce red-eye. There's an unmarked tactile control dial for changing the exposure compensation (+-2EV) or the shutter speed, dependant upon the shooting mode, alongside the ridged dial for selecting one of the 12 different modes. As the X-M1 is a more consumer-focused camera, there's a smattering of scene modes alongside the beginner-focused Auto modes and more photographer-friendly P/A/S/M modes. The clever Advanced SR AUTO automatically optimizes the shutter speed, aperture and other settings, instantly recognizing 58 scene types and then choosing the most appropriate settings. Also new to the X-M1 is the Advanced mode, which offers a range of 13 different filter effects that can be previewed on the LCD screen (JPEG only). The Fujifilm X-M1 can record full HD 1080p or 720p movies at 30fps with stereo sound, with a handy one-touch movie record button on the back of the camera. It's fair to say that the X-M1's movie mode isn't overly advanced. You can set the aperture and shutter speed before recording begins, but not during, and you can also set the Film Simulation mode, so black and white footage is possible. Continuous auto-focusing is possible, although it tends to hunt around a lot before locking onto the subject, and manual focusing is also available (with the same caveats as for stills). There is a HDMI port for connecting the X-M1 to a high-definition TV, although as usual there's no cable supplied in the box. Also missing is a paper copy of the otherwise helpful manual, which is supplied on CD-ROM instead, along with the consumer MyFinepix software the slow and rather unintuitive RAW converter (essentially a specially customised version of the commercial Silkypix application). The X-M1 has a fairly logical rear control layout, with almost all the controls located to the right of the tilting LCD screen. Underneath the second control dial, there's a cluster of buttons for choosing image playback, one-touch movie record, the focus point, white balance, continuous shooting and focusing mode, plus a central button which accesses the Main Menu system. 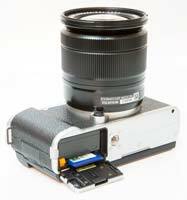 The Q button provides quick access to lots of frequently used shooting settings including the ISO speed, White Balance, File Size and File Quality, with the 4-way controller and control dial used to quickly change them. Finally the Disp/Back button is used for changing the LCD display or going back.